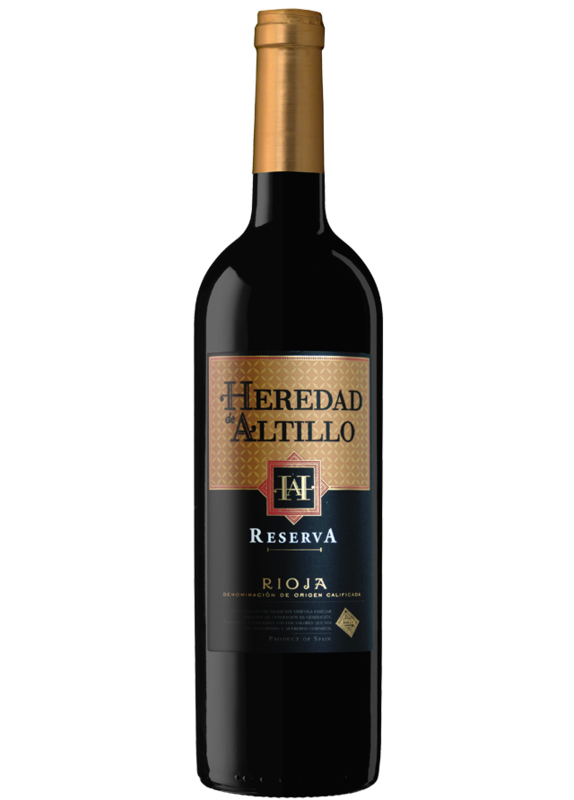 Heredad de Altillo reserva is made exclusively from the best plots located in “La Rioja Alta” area. The Tempranillo grapes are chosen from old vineyards with small production. The result is a superb, elegant and well balanced wine. Spain’s most internationally famous wine region is renowned for creating top quality wines with exceptional ageing ability. It lies in northern Spain, by the side of the River Ebro from which the region’s name derived. Elegance and poise is the hallmark of the wines shaped in this ancient region. The variety of its soils, together with the combination of modern and traditional growing practices allow winemakers to produce a wide range of wines that exhibit different personalities, always within the framework that their long-established Qualified Denominación de Origen demands from them. . Deep cherry red in colour, quite dark and intense. On the nose, it displays aromas of sweet matured fruit; and aromas of soft and new oak. The palate is fruity, elegant, pleasant and well balanced, thanks to the perfect balance between acidity and tannins. It has an intense and long finish. This Reserva is a perfect partner for all kinds of meats, warm soups and stews, chorizo, cured cheeses, etc. Best served between 16 and 18ºC. The grapes are carefully selected and handpicked. Then, they undergo the fermentation process at a controlled temperature (26-29ºC) for ten to twelve days. After that, the twelve-day maceration process allows the skins to be in contact with must; this ensures that the wine acquires its characteristic colour and polished tannins. Finally the wine is aged for eighteen months in new American oak barrels, before resting quietly in bottles to ensure complete maturity.